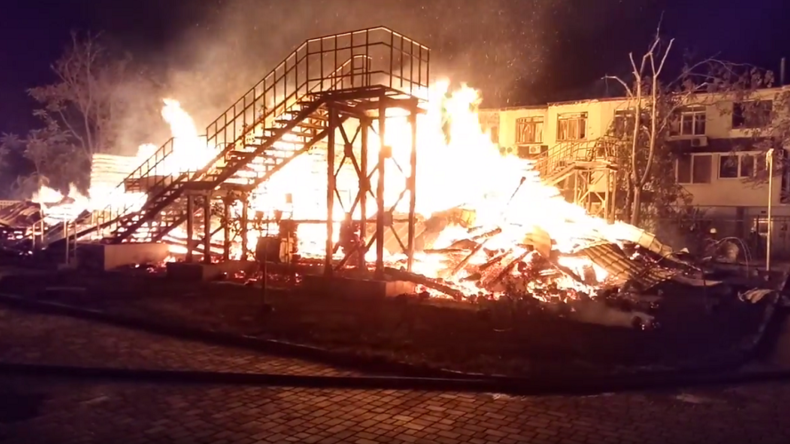 At least three children have been killed and several others injured after one of the dormitories at a children’s sports and leisure camp in Odessa, Ukraine caught fire and burnt to ashes, local media report. A fire at one of the blocks at the Victoria children’s camp on the Black Sea coast started shortly after 11:30pm local time. Some 150 children were on the campus when the fire began. At least forty-two of them were in the dormitory building which caught fire late Friday evening. Initial reports indicated that three children were missing. Officials later confirmed the discovery of three bodies, but it's still unclear if these are the bodies of the missing children. “According to preliminary data, three children were killed,” Ruslan Forostyak, an adviser to the head of the National Police in the Odessa region, wrote on Facebook. Earlier reports said one child had died in the flames. According to eyewitness reports, children were awoken by the smoke in the building. The teachers rushed to get the children to safety. However, despite a well-organized effort, some of them reportedly suffered smoke inhalation, injuries, and bruises. Several children were reportedly taken to hospital after they jumped from a window of the burning building. The representative of Odessa’s Dispatch Service, Yevgeny Kavun, said the fire alert came in at 23:37 local time. Emergency teams were quickly dispatched to the scene where they found a three-story wooden building in flames. The fire spread rapidly, engulfing an area of roughly 1,000 square meters. Putting out the fire proved to be difficult as there are no emergency water sources on the territory of the children’s sanatorium. There is a hydrant, but the pressure was weak and access to a fire reservoir was blocked, Kavun said. Firefighters found a water supply some 1,200 meters from the campus. It took firefighters over two hours to quash the flames of the completely burned down structure that was also threatening nearby wooden cottages. Fire crews had to hose down the neighboring dorms due to the extreme heat. Eyewitnesses said the heat was so intense that the balconies of nearby buildings begun to melt while the glass shattered. The burned down building of the leisure camp was plagued with electricity-related problems for some time prior to the tragedy, survivors, including children and their parents, told Ruptly. “The fire alarm has been going off every day,” a mother of a girl who left the camp a day before the tragedy said. “There have been huge voltage drops, [a fire alarm] went off for no reason,” one girl said. Apart from problems with the fire alarm and malfunctioning electrical grid, the building lacked basic fire safety supplies, according to the survivors. The children praised the efforts of the camp personnel to rescue them, stating, however, that when the leader woke them up, the building was already engulfed in flames. “Half of us were barefoot, we did not have time to take anything. I ran out only in my underwear, grabbed my shorts and ran,” a boy said. The director of the Victoria leisure camp was detained by Ukrainian police on Saturday for fire safety violations, the police press service said in a Facebook post. Prior to that, the mayor of Odessa relieved from their duties the head of district administration, the camp director, and his deputy responsible for fire safety. The director of a local education department also resigned in the aftermath of the tragedy.